The Question: I first noticed in my garage that a lot of small bugs that look like small yellowjackets were lying around dead around the windows inside the garage. First I thought that the spiders that live there were catching them, but I’ve never seen these yellowjackets in this area before. I don’t know where they might be coming from and why they are congregating to die. Now I’m finding them inside my house. Where might they be coming from and why are they all dead? I’m very happy they are not alive and stinging inside my house, but I would like to know what the situation means. The Not So Short Answer: These are almost certainly the Eastern Yellowjacket, Vespula maculifrons, one of our most common yellowjackets, and the smallest yellowjacket (about 0.5 inches, 1.3 cm) in North America. I zoomed in on one part of your photo to show the characteristic shape of the black coloration on the first abdominal segment. According to Sam Droege, a biologist at the Patuxent Wildlife Research Center, this typically takes a “boat anchor shape” in the Eastern Yellow Jacket. 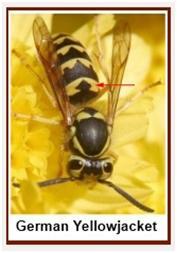 The two other common yellowjackets in Georgia would be the introduced German Yellowjacket (Vespula germanica – also called German wasp), which is slightly larger and has more of a diamond shape on the first abdominal segment, and the Southern Yellowjacket (Vespula squamosa), which usually has a connecting line in the first abdominal segment, and has two lengthwise yellow stripes on the th orax. As to why you have Eastern yellowjackets in your garage, that’s something of a puzzle. Y ellowjacket colonies die out each year, with only newly mated queens living over the winter. But September is a little early for a colony in Georgia to be calling it quits for the season. 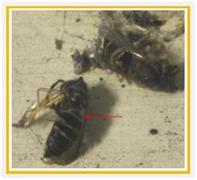 Some yellowjacket species nest readily in houses and garages, but the Eastern Yellowjacket generally doesn’t. 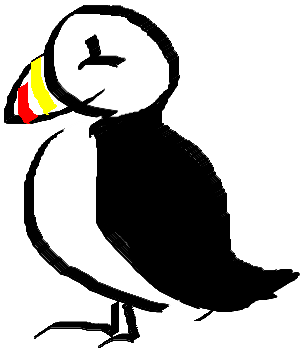 They build paper nests in holes excavated underground. Mr. Droege wonders if you have a nest right near your house or garage. “This time of year, the colonies are at their peak but may be running low on available food. They may simply be moving into the house and garage while searching for yummy things (likely there is something that smells attractive in both places). They then get disoriented and end up trying to get out near the window. Bees – generally plump and furry looking. Their legs usually don’t show when they’re flying. Examples are the familiar honeybees and bumblebees. Their food is nectar from flowers. Wasps – generally thinner, without the furry look. Usually have two legs dangling when flying. 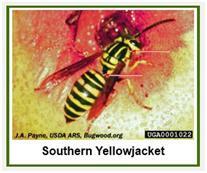 Examples include yellowjackets and paper wasps. Most wasps are predatory or parasitic. Yellowjackets also go for fruit and human food, especially sugary drinks and meat. Hornets – some species of wasps, usually fairly large ones, are called hornets. Examples include Bald-faced hornet (Dolichovespula maculata – white and black) and the European hornet (Vespa crabro). The Interesting Science: What do ants have to do with wasps? Well, funny you should ask, because ants are really a type of wasp. As the phylogeny (evolutionary history) below shows, the insect order Hymenoptera includes two Suborders, the Symphyta (sawflies) and the Apocrita (wasps). Within the Apocrita, there are the Parasitica, which includes a vast number of parasitic wasps, and the group of more interest to us right now, the Aculeata. If we go further into the Aculeata we find the Superfamily Apoidea (which includes the familiar honeybee, bumblebee and various bee-like wasps), the Superfamily Chrysidoidea (other wasps), and the Vespoidea. The Vespoidea includes the Family Vespidae, in which we find yellowjackets, paper wasps, and some other common wasps. And also within the Vespoidea is a very important family, the Formicidae – the ants. So, nested down inside the evolutionary tree of wasps we find all the many species of ants. Traditionally, “wasp” has referred to any member of the Apocrita that is not a bee or an ant. So ants have not been considered to be wasps. That is largely because the original traditions of naming and categorizing animals were not based on evolutionary history (which was unknown at the time). More current conventions try to take evolutionary history into account. You may have heard people say, for example, that dinosaurs are not extinct because birds are really dinosaurs. That’s because if you look at the evolutionary tree of birds, you find that they are nested inside the evolutionary tree of dinosaurs – just the same way that ants are nested within the evolutionary tree of wasps. Under a system of naming that takes evolutionary history into account, ants would be a variety of wasp – a very successful offshoot of the Vespoidea wasp lineage that includes those yellowjackets. Thanks: My thanks to Sam Droege for his generous help. 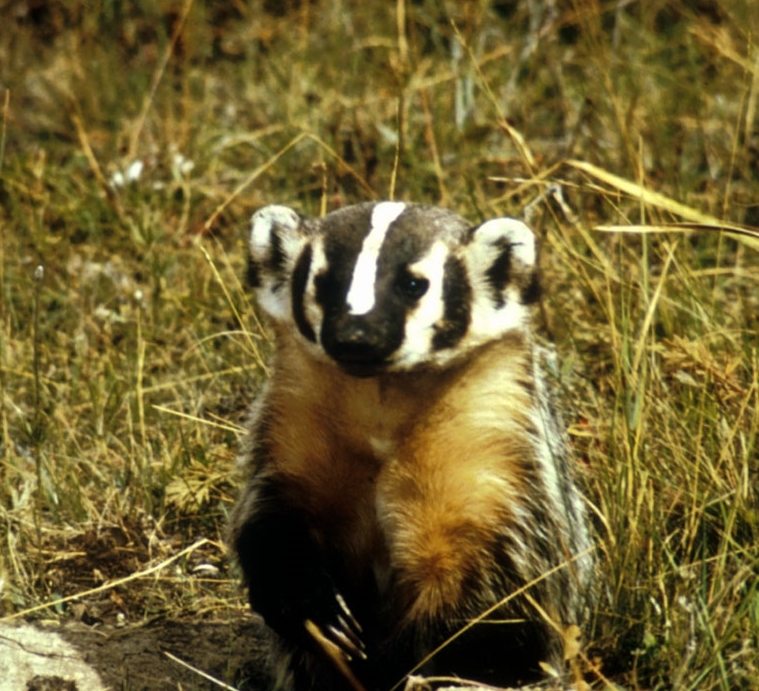 Mr. Droege is a researcher at the Patuxent Wildlife Research Station, operated by the United States Geological Survey, which despite the “Geological” in its name, is the federal government’s primary agency for wildlife research. Cite this article as: Pelletier, TC. (September 26, 2010). Why are These Yellow Jackets Dying in My Garage? Retrieved from http://askanaturalist.com/why-are-these-yellow-jackets-dying-in-my-garage/ on April 21, 2019. Previous PostWhat is this Jelly-like Blob Under My Dock?Next PostIs it Safe to Swim with Freshwater Jellyfish? Hello. I live in Cincinnati Ohio. I recently had a Yellow Jacket nest removed from the wall in my home about a week ago. They were coming in the back of the porch light through the brick wall. He cut a small area of my interior wall and removed it and took the queen and everything, but I’m occasionally still finding dead ones in my kitchen and basement. Is this normal and how long will I see them? I asked him if you got the whole nest and queen again today and he said he did. Are these just stragulars? Do I have another nest? By the way I think I have the Eastern yellow jacket back with the anchor. It seems likely that they are stragglers. And my guess is that without a hive, they will not last long, but I don’t really know how long. Did you ask the exterminator? He might know. If nothing else, yellow jacket nests go dormant when the weather turns colder, so hopefully, even if the few who are left don’t immediately die, they’ll go dormant and then in the spring, they’ll die or disperse without a queen and a hive. So I’m guessing they won’t be a problem for much longer. I have noticed a phenomenon for about the last 10 years in the DFW area of Texas. We can go all summer and see few yellow jackets and wasps. In fall coming out of summer, we get temps changing from hot , to cool, and mild,back to hot. The temps swing all over from day to day. Anyway after the first cold day,the next day The yellow jackets and wasps are out like crazy flying around appearing to find a shelter location for the winter. I mean at least 100 flying around my house seperately inspecting each crack and crevis. The reason I know they are looking for a place is because they will crawl in the crack around my shed doors. I have opened the shed doors on a cold day to find them lined up in a line from the bottom of one side of the door across the top and down the other side. But in the cold they can not move and are sprayed with bug spray. They are trying to over winter.If i had opened the door on a mild or hot day I would be in trouble. Anyway have seen this for many years and i dread the first cold day, because I have to go get a bunch of bug spray that’s not cheap every year. This lasts for about a month,usually beginning in October because that is usually when we get the first cold day. It started today Oct 27.2015.I have never seen any info on the web about this,that is why I am writing this. Ok they seem to have divided into about 7 different nests with about 25 per nest. I have been told these are not yellow jackets. They are yellow and orangish brown striped paper wasps. Hello there, I live in NYS and just yesterday vacuumed up about 2.5 dozen of what appears to be baby yellow jackets. They are very tiny, no larger than the height of a dime and you can distinctly see the black and yellow stripes. I found about 10 dead in my bedroom windowsill and over 20 dead in the hallway on the floor. There was on large bee (unsure of which kind) crawling up the hallway window and when I went to grab a show to kill it, it had flown away and disappeared. I bought some RAID Wasp and Bee spray and when I got home sprayed the one bee that was still alive. It was much bigger then all the dead ones on the floor so I’m thinking it may have been the Queen. 95% of the dead yellow jackets were in the upstairs hallway near the window, but I found 2 stragglers in the downstairs living room this morning. Any idea as to why they appeared out of nowhere from one day to the next? And why they were only upstairs? I’m not complaining that they were all dead because I am deathly afraid of anything that fly ands stings but I would like to know if I need to start searching for a nest or colony inside my house. Hi Jessica, can you take a photo of the tiny dead yellow jackets, with something in the photo to show the scale? I live in Edmonton ab Canada. 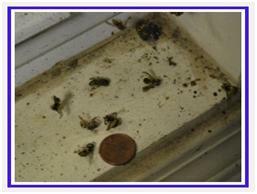 at the beginning of oct,we noticed wasps flying into a corner crack outside our home,under the stucco. we tried spraying foam, a few times. now,a few wks later,winter weather is arriving all to soon,but now we have a problem with large, lethargic wasps in my bsmt. a few have made it upstairs. im very allergic, so I found out last yr,and have to carry a epi pen everywhere. anyway I can get them,before they get me?? I would like to hear the response to this. I also live in New York state, western New York to be exact. For the past week I’ve been finding yellow jackets in my house. Some are dead in window sills , others seem to be dying, moving very slowly around light fixtures in hallways and my bathroom specifically. They have been all sizes ranging from small looking almost baby like, to the regular size ones we see flying around outside, to one extremely large one I killed yesterday ( much larger than the rest-scared the hell out of me as I am allergic). I searched my bathroom as that is where I’ve found the most (they’re hanging out above my bathroom mirror where the light fixture is), and behind the light fixture there is a small hole where some electric cords come out of the wall I’m not sure if they’re coming in thru there or what. Around the same time (a week ago) that I started finding them in my house I started noticing them in my basement as well. I’m concerned they may have gotten in a wall thru the basmebt and that is how they’re getting into my bathroom but I’m not positive. The first few days I only found maybe one or two a day. Yesterday morning I woke up to at least 4 in my bathroom including the giant one I killed. I was told since its been getting very cold lately at night they’re prob looking for somewhere warm to come into and if there is a nest it’ll die out but I’m concerned they could possibly survive over winter if they’re inside the wall of the house where it may be warm enough ? I am terrified of them , and have a four year old daughter who has never been stung yet so I have no idea if she’s allergic as I am so I’m worried about that as well. Do I need to call an exterminator or will the cold weather kill them off ? Just last night it reached down into the low 50’s. My response to BetteAnn and Megan, who both are allergic, is to call an exterminator. It’s entirely possible that you have a nest in or around your house, and though the onset of cold weather might take care of the problem in a couple of months, it might also make it worse in the short term, as the insects come into to the house to die. Given your risk, I would call a local exterminator to at least get an opinion of how they are getting into your house. I live in CT on the NY line, for the past week have been vacuuming up these smaller than summer size yellow jackets all over the house. No idea where they are entering. Most are dead some are weak and still walking around window sills or other lit areas. This is the time of year where we have quite vast temp extremes from summer like to almost freezing. 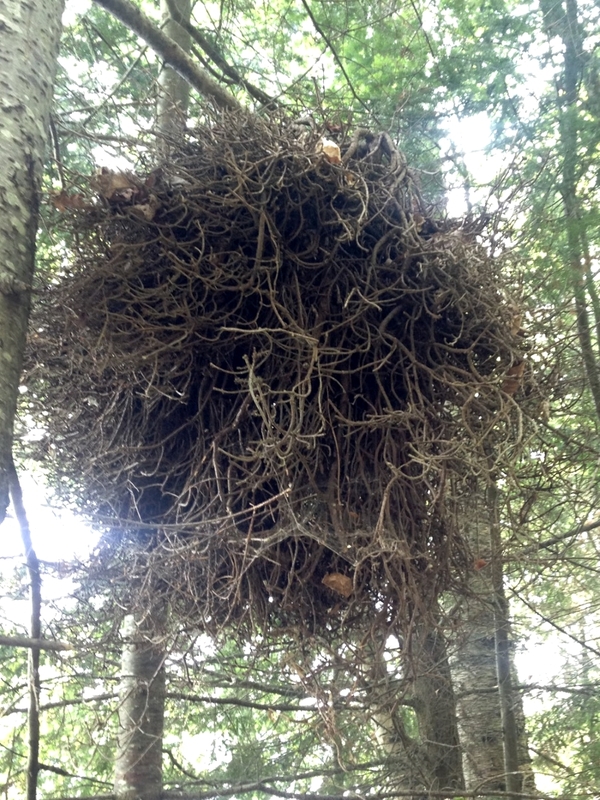 Can’t see any obvious nests outside house or under soffits, etc. 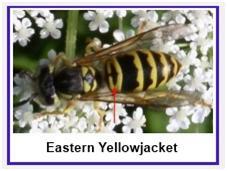 Hi John, can you take a photo of your yellow jackets and email it to tom@askanaturalist.com? I keep finding wasps (that look like the ones in the OP) around the house. 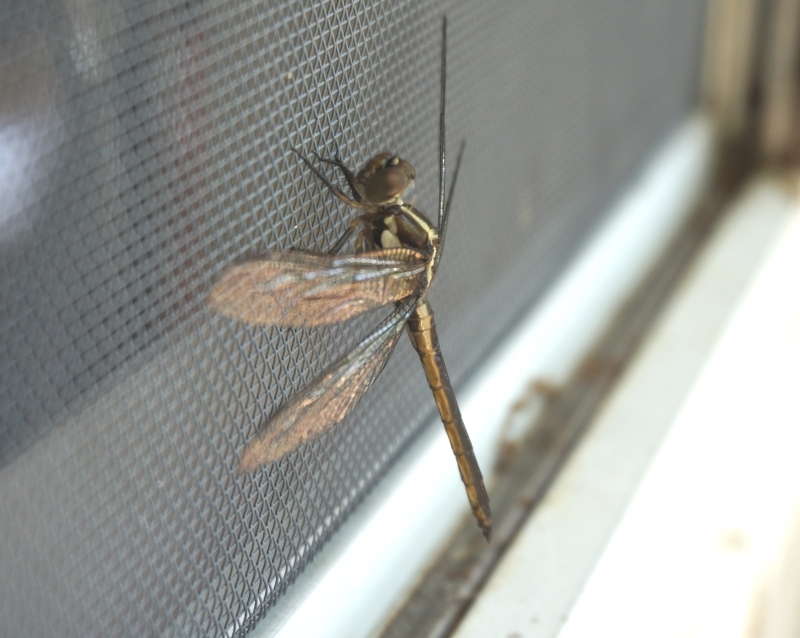 One day we found 5 flying around the upstairs/half moon window above the front door of the house. The next day I found one crawling around in my son’s room (2nd floor), looking like it was close to dying. The next day we found one in our room (second floor), crawling around like it was close to death. A few days later we found one in the 2nd floor bathroom, crawling around like the previous 2. Yesterday there was one flying around by the half moon window. We did not see them all summer. We have checked all the windows (especially the second story windows) and doors for gaps, and have not found any. We have looked around our deck and front porch for nests and not seen any. Where could they be coming from? Also, why would they all be upstairs? I am not allergic but have an intense fear of stinging insects and it is causing anxiety. We live in Kansas City. About a week ago we have had these German yellow jackets in our bedroom window- we can’t see how they enter. We have been catching the ones alive and releasing them. But there are plenty that are dying in our window also. Funny story – One summer day I stepped on a yellow jacket as I was coming out the door to my back porch – barefooted. Honeybees had stung me many times in the past, but the pain was only mild. This was much different. I literally fell back through the door and onto the floor, writhing in pain. Abscessed tooth and ruptured appendix are the worst pains I have ever experienced, but this was right behind them. All I could think of was my mother and grandmother tearing up a cigarette and putting tobacco on the sting. Don’t know why they used to do that, but it did not help one bit in my case. Then I thought I remembered somebody saying to use ammonia , but that was unsuccessful at relieving the pain as well. My foot had swollen up quite a bit by the time I stuck it in a bucket of ice water. As luck would have it, I was stung on a Saturday which began a three-day holiday weekend. Seems like I slept that night with one leg dangling off the bed and one foot in the ice water. At least the ice numbed the pain somewhat. After that painful incident I became deathly afraid of yellow jackets and would take off running at the mere sight of one. Unfortunately, a few months later I sat on one as I was getting into bed. Don’t ask me how it got in the bed. As soon as I hopped up and saw what it was I started freaking out. I’m not much of a cusser, but my roommate said she heard me hollering things that would make a sailer blush. Hi Anne, So sorry that you keep getting stung. But I’m impressed by your sense of humor about it. 🙂 Is it possible that the first sting was something other than a standard yellow jacket? Some wasps that look similar have a more painful sting, I believe. I didn’t really get a good look at it. Maybe it was a paper wasp? I saw some photos that looked similar to a yellowjacket. I have had Vespula Macullifrons, at least that is what I think, inside the house for several weeks now. We have sprayed and then used powder but they are still coming in. This is occurring in one specific area of the house but after spraying the entry site this has not changed. However I don’t see any wasps coming and going at the nest site. Could we have 2 nests in our siding? I have a photo I can submit of those wasps I have killed in the house. Sure, if you want to send the photos, send them to tom@tompelletier.com. Are you talking about the entry site from the outside, or the entry from the wall to the inside of the house? We sprayed their outside entrance. Inside they come in various ways, through the can lights, the cracks around ceiling can lights and as I covered these without stopping them somewhere else.